A thief stands accused. 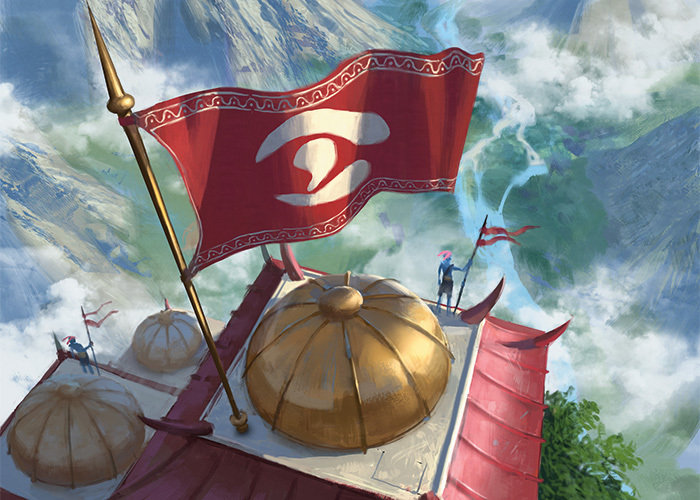 A Jeskai village is ready to mete out justice. But true justice has only one source. The sing-song voices and pattering footfalls drew Kela's attention. She shifted her gaze, all the while keeping her neck faultlessly straight and walking step for step at Dar's side. A handful of Jigme Village children were racing toward them along the far bank of the babbling river. "Do you think they'll say he's guilty?" the boy in front called back to the others. "He is guilty!" said a slightly chubby boy with flushed cheeks. He ran past the other boy. "How do you know?" a girl with a fringe of straight, black bangs panted. "I know because—" Abruptly, the chubby boy slowed to a stop. "Wow." He pointed at Kela and Dar's foreheads in awe. "Look." The others fell in behind him, staring unabashedly. "The dragon's eye," the first boy said reverently. "The marks are so bright," said the girl with the fringe. "They hurt my eyes." The chubby boy shielded his face. "That's ridiculous." This voice, an annoyed mutter, came from Kela's other side. Kela looked without moving her head. She wouldn't have seen the girl in the tree had it not been for the child's glistening eyes. They were sharp and bright and they followed Kela and Dar's every move. "It's a symbol of strategy," one of the children on the other side of the river said. The girl in the tree rolled her eyes. "Cunning. The dragon's eye is a symbol of cunning." She spoke in a whisper, barely loud enough even for Kela to hear. "It means they're really good at combat," one of the other children said. "Incorrect," the girl in the tree said. "It means they are on a path to enlightenment." She touched her own forehead, an act that looked familiar and practiced. "A path that led them here. A path that will lead us all to the places and times we are most needed." She closed her eyes and dipped her head in a bow. How Kela wished that those words were true; she did not feel she was on a path, rather that she was wandering aimlessly, following Dar. Suddenly, the branch beneath the girl gave way with a sharp snap. The girl reacted before Kela could, flipping and somersaulting as though the whole stunt had been planned. She landed soundlessly in a crouch like a cat on the side of the path. Her piercing eyes flashed to Kela's. Caught, she stood and smiled shyly. Kela stretched her lips into a configuration they weren't much used to, returning the gesture. "What are you doing?" Dar's voice startled Kela out of her grin. Her eyes shot forward. "Nothing. I was just—"
"We're not even to the village yet." "There are villagers here, are there not?" "And they can see you talking." "They can see you talking. You spoke fir—"
"Enough. You shall not show emotion. What we do, it's all about perception, Kela. When will you understand that?" "What we do is about justice, brother." "A justice that the Jeskai only accept because of the way we are perceived. If that perception is tarnished, so too will be our decrees. Is that what you want?" The question felt like a trap; Kela didn't dare shake her head, nor speak a response, for that was a trap too. Luckily, she was saved from doing either as they arrived at the village gates. Jigme villagers lined the bridge on the other side of the entrance. Eyes and mouths hung agape as Kela and Dar approached. It was a narrow bridge, and with villagers on both sides it was only wide enough for one of them to cross at a time. Dar went first. He always went first. He had done everything first since the day they were born. Although they were twins, he had been born first—first by a day. He in the evening, and Kela in the morning of the next day. Being born in the morning light was the reason she was innocence. And Dar's birth in the darkness of night was the reason he was guilt. At least that was as it should be, that and nothing else. A gong sounded from the village center. Kela could feel the reverberations in her chest. She followed her brother through the corridor of chattering villagers into Jigme Square. As she walked she caught snippets of gossip, slander, and suspicion. "...guilty as water runs south..."
"...don't need arbiter twins to tell us..."
"...he never even climbed the Initiate's Stair." Together, Kela and Dar ascended three shallow steps and came to stand on a low wooden platform in the village center. 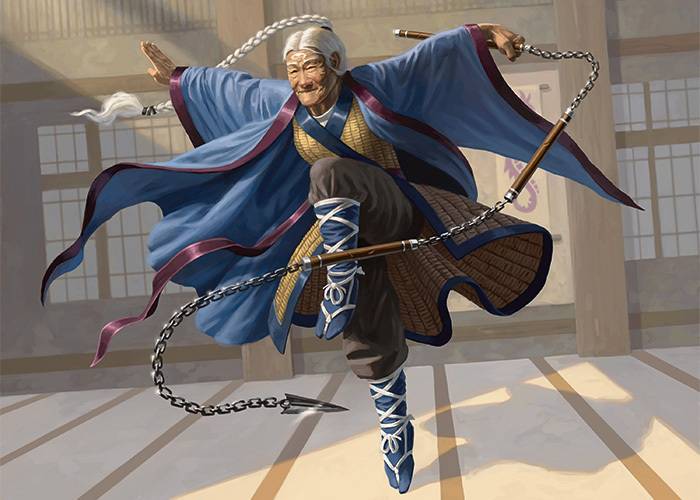 The village elder, a woman with a tight, white braid running down to her ankles, bowed to them. A breathless quiet settled over the villagers. "Welcome to Jigme." The elder's voice was crisp. "I am Elder Ngabo. You honor us with your presence, Arbiter Twins." She bowed long and low. "May justice be served today." "So say the Rules of the Reeds." Dar and Kela returned the bow, Dar dipping slightly lower than Kela. They were supposed to be equals; they were supposed to be balanced. That was how justice was ensured, by innocence equaling guilt in every measure. But with Dar being born the day before her, with the way he held himself over Kela, it was a wonder that they could serve justice at all. Kela often thought they should not, that she should not. "Come," Elder Ngabo said as she stood. "It is time." Like all courts in all small Jeskai villages, the Jigme Village Court was carefully maintained. The floors had the look of just recently having been swept and the matching pillows that had been laid out for Kela and Dar looked as though they had been freshly embroidered. Kela had heard that Jigme was known for its exquisitely crafted fabrics. As she settled into the soft cushion, Kela glanced around the courtroom. It was small; there was only enough room for a dozen villagers to watch the proceedings. That was fine with her; the scrutiny of too many eyes made her feel like a fraud. "This court has been called to session under the Dragon Eyes of the Chensal Twins." Elder Ngabo spoke before the small crowd. "Today, we hear the case of Lotse Taring against the Jigme Village." She extended her arm, gesturing at a raw, rangy man who stood near the wall with his head bowed. "May justice be served today." "So say the Rules of the Reeds," the villagers intoned. With that the room fell silent, and Kela and Dar began the Ritual of Arbiter Twins. Through a series of slow, controlled movements and a low, sonorous chant, they fell into a state of deep meditation. They would hear the trial from that state, connected as they were to truth, justice, and the way of the dragons. The trial proceeded around them; Lotse Taring was persecuted and he made his defense. The case was straightforward. The man was accused of thievery. Nine baskets of apples had been stolen from the Village reserve. Three baskets had been found in Lotse's shelter, less than a half day's journey from Jigme. Six more baskets were found empty not far off, and many wandering Jeskai who often went hungry had littered cores along the nearby trails in the days that followed. Lotse admitted to feeding the hungry, but he also claimed the fruit was his to give. The voices washed over Kela, rocking her gently as she slipped ever deeper into her meditation. Lotse's tearful voice swirled around her. Elder Ngabo's words danced on Kela's eyelids. And Kela was transported to the place where justice dwelled. When she surfaced from her meditation, Kela slowly became aware of her surroundings. She was in the Jigme Tower of Innocence. The trial had ended. She had been carried up to the top of the tower while still in her meditative state, as was the tradition. She faced the moment of judgment. That moment was supposed to be one of purest clarity, a moment only Arbiter Twins could experience. She was supposed to open her eyes knowing the verdict, feeling Lotse's innocence or guilt in her soul. But the only thing she felt in her soul was the weight of deception. Her deception. It was what she always felt in every Tower of Innocence in every Jeskai village she and Dar had visited. She was a fraud. As she looked to the oil lamp in the center of the tower her stomach tightened. It was for her to decide if she should light, or not light, the wick. No, it was for her to know. But she did not know. She stood and paced the small circumference of the room. There was not much time. Soon the gong would sound, and at that moment she would have to act. Dar would act too; he would light or not light the lamp in the Tower of Guilt. But unlike her he would know unquestionably what he should do. Dar always knew. Kela tried to think back on the trial, tried to sort through the details that swam in her mind. Was Lotse innocent? It seemed like he might be. Perhaps. She should light her lamp, she thought. Yes she would light it. She tried to feel confident about her decision. That was the trick to it, or so her mentor at the Cori Mountain Stronghold had told her, time and again. "You must believe in yourself, in what you feel inside, that is where the truth lies." Only one flame could burn. Arbiter Twins, for as long as there had been Arbiter Twins, only lit one flame at every trial. 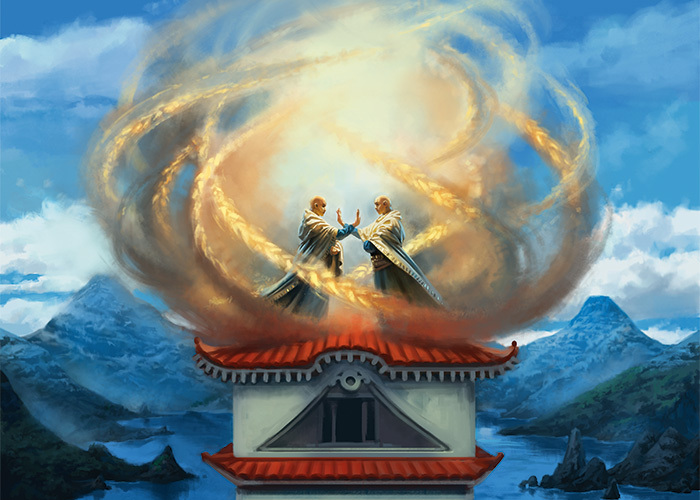 Twins did not speak to each other, they were not allowed to see each other, their towers were separate, yet somehow only one flame was ever lit. Never two, never none. That was how the villagers knew it was justice. Kela picked up the flint and moved to strike it, but then she stopped. No, she should not light it. No. He was guilty. "Oh, I don't know." She held her breath, clenching the flint in her fist. "Please, please, please." "Guilty! He is guilty!" The cries rose up from the villagers below. "Give us back the apples!" Lotse was guilty. Dar had lit his lamp. She had been right to leave hers cold. The celebration that followed was as much for the Jigme villagers as it was for their guests. Music was played on hand-carved flutes, magical dancing lights filled the sky, and villagers sang, hands clasped, around fires. At the edge of the crowd, Kela picked out the girl from the tree. She was observing the festivities intently, but was unwilling to join in. When she noticed Kela watching her she offered the same shy smile she had earlier. Her admiration for Kela was obvious in her wide eyes and Kela was thankful that she and Dar had been able to live up to the girl's expectations that day. It was one more trial that they had arbitrated successfully, one more time that they had, despite their imbalance, despite her fraudulent birth, executed justice. She glanced at Dar. Was it possible that was their path after all? Was there a chance that she belonged? Dinner was served to the village elder first, as was tradition. It was flatbread and, fittingly, if not appropriately, a thick apple soup. "Thank you." Elder Ngabo nodded to the young man who had served her. All eyes were on the old woman sitting atop the wooden platform as she tucked a wisp of her white hair behind her ear. She wafted the aroma of the soup to her nose and nodded. "Smells good." There was a smattering of polite laughter. Kela could sense the hunger behind the sound; they would not be served until the elder ate. Elder Ngabo finally lifted the bowl to her lips and drank the soup. She swallowed once, twice, and then she lowered the bowl, a smile on her face. "It is del—" Her voice caught in her throat. She cocked her head to the side as though puzzled, and then her eyes shot wide. She raised her hands to her neck, clawing wildly, her face turning gray. The dancing lights fell from the sky. Villagers crowded up the shallow steps, running to the elder's aid, healers and mystics. The commotion escalated to a frenzy...and then, just as quickly, it diminished into silence. A Jigme healer stepped back, shaking his head. "What happened?" a stray voice wondered. "I don't know," came an answer. "She just—she just—"
"She was poisoned!" This voice was loud and sure. "It was the apples!" Kela was not the only one to gasp. The Jigme villagers mobilized, and before Kela's mind could catch up with their feet they were at the doors of the prison, pounding them down. They broke into Lotse's cell and dragged him out. A mob, thirsting for blood. "Stop!" Lotse begged. "Stop, please!" "We will have your head for what you have done!" A Jeskai warrior drew his blade. "No!" Kela jumped in front of the sword. She didn't realize she had leapt until she was there, staring at the sharp tip, her breath coming in quick, short gasps. "Get out of the way!" the warrior shouted. Kela recognized the second voice as Dar's. He was standing back from the crowd glaring at her. She knew what he was thinking without his need to speak. That was not the way he wished for the villagers to perceive them. He was telling her with his eyes to get up, to get out of the way, and to let them kill the man. But she could not move. Something bound her to that place, that moment. It was as though she had been walking a long road and only then had she realized this had been her destination all along. "Get out of the way, so help me!" The warrior pressed his blade to Kela's throat. "He should have a trial," she whispered. "What did she say?" The question came from further back in the crowd. "What did you say?" the warrior asked. "He should have a trial," Kela said, slightly louder this time. "But he is a murderer!" a villager cried. "Murderer!" The voices of the other villagers echoed. "Can you say he is not?" the warrior asked Kela. Kela looked to Lotse. There was fear in his eyes, fear and pleading. She tried to see more, but there was no more to see. She did not know if he was guilty or innocent. She could not tell. "Well?" the warrior pressed. "Say it, arbiter. If you can. Say he is innocent." Kela saw Dar behind the warrior, his lips curled up into a sneer. And around him it seemed that all the villagers mimicked his expression. The sneers made Kela feel foolish. What had she done? What was she thinking? She looked away, down to the muddy ground, for there was nowhere else for her to look. And that's when she saw the girl from the tree. The girl was staring up at Kela, wide-eyed, from under the shelter of an upturned wagon. Their eyes locked, and in that moment Kela understood something she had never fully understood before. There was more at stake here than the guilt or innocence of one man. Jeskai justice was at stake. And the girl from the tree was holding Kela to her part in that moment. "See! She cannot say it!" a voice from the crowd called. "She cannot say he is innocent!" "Enough!" Kela found her voice, shaking though it was. Fear didn't matter. She nodded to the girl from the tree and pushed aside the warrior's blade. She got to her feet and faced Dar and the wild Jigme villagers. "I will not stand for this!" She had never felt that way before. Flame was coursing through her veins and lapping at her soul. Rather than holding it in, she let it flow, to flow out of her in the name of justice. 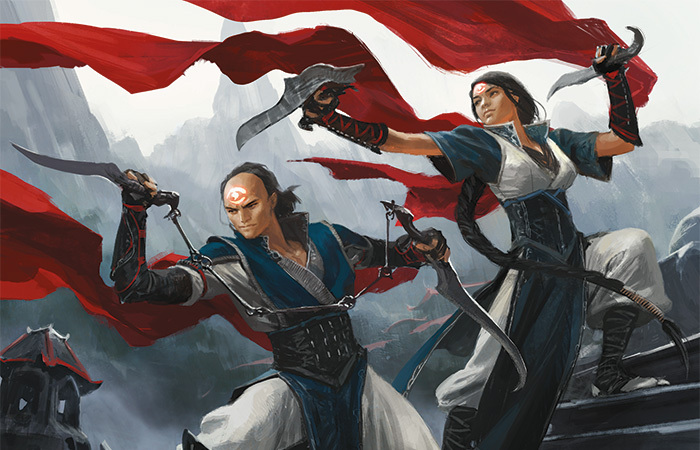 "The Rules of the Reeds dictate that any Jeskai accused of murder will have a trial. So this man shall. I will not make a judgment until I am in my tower!" "Is this what you would have too, twin?" The warrior turned to Dar. Kela felt slightly sorry for her brother then. He had no choice but to agree with her, both for perception's sake and for the sake of the Rules of the Reeds. "But—" Dar held up his hands before they could launch into their cries. "But we will be quick. Let us go to our towers now and make our judgments as my sister wants. Let us do that before you have his head, let us do that and your village will not be guilty of breaking the Rules of the Reeds." "So be it!" the warrior cried. "Light your flame if you must. It will do well to cast a light on the murderer's beheading!" The Jigme villagers cheered and moved toward Kela and Dar as one. Kela shouted, but her voice was not heard above theirs. She was hurried toward the tower and shouldered up the stairs. That was not how an Arbiter was to be treated. That was not how a trial was to be run. He shook his head once, sharp and pointed. She knew what he was telling her: "Do not light your flame." He would be lighting his, affirming the villager's beliefs, upholding the perception of justice. But justice was not a perception. Kela was thrown into the room at the top of tower and the door slammed behind her. She barely had time to push herself to her feet before the gong sounded. Driven still by the flame inside, she ran for the flint and struck it. Then she lit wick. The lamp of innocence ignited. "What is this?" The cry from below came mere seconds later. Kela ran to the window. All of Jigme was staring up at her and Dar. The mob turned on the towers and so too did their thirst for blood. Kela's tower shook as they climbed, and they were at her door the next moment beating it down. Kela sprang out through the window. She sprinted down toward the ground on the currents of the air. She would not fall to those hands, not that night. "What have you done?" Dar stormed onto the current of air that supported her weight. It shifted under them as he followed her. "You are ruining us, sister. They will never trust us again." "I am not ruining us, I am saving us. We do not know the judgment. This was the only way." Kela hesitated, slowing. The current trembled beneath her feet. Dar had spoken so surely. She looked back at him over her shoulder. His face was a mask she could not read. "I know the judgment," he said again. "That should be enough for you, sister. Come now, you never knew anyway, did you? I could always tell. It was all blind luck. A guessing game. 'Will Dar light his flame?' How many times did you ask yourself that?" Kela faltered and the current of air dipped. She lost her footing and her control and she plummeted to the ground. For a moment all was black. When she blinked the world back into focus, Dar was standing above her, his sword drawn. "Do not make me do this, sister. Concede to me. The thief is guilty of murder. I know." But Dar did not know. Kela was sure. She was certain. The feeling welled inside her, and she recognized it then. She had felt it before, so many times before, in all of the villages, in all of the Towers of Innocence, in that very village earlier that day when it had told her not to light her flame. It had only been a whisper previously because she had not given credence to its voice. But then, when she was listening, it was screaming. So she screamed too. "No!" She rolled out of reach of Dar's blade and jumped to her feet. "You cannot know if I do not know." "Don't be foolish, Kela. If you attempt to fight me, I will kill you. Put down your blade." "Only one justice will force my blade from my hand." Kela swung her sword. Dar parried. "We will fight, brother. For the judgment of this moment, we will fight." Their blades met in mid-air with a great clang. And so began their Combat of Clarity. It was an old, unused tradition of the Arbiter Twins. If ever they disagreed on a verdict they were to be set to single combat. It was said on the scrolls that so evenly matched as they were, the only thing that would set the twins apart would be the clarity of their judgment. The twin who was fighting for justice, defending truth, would have the edge, as slight as it was, and would therefore be victorious. Kela possessed the clarity in that combat and she knew it. She could see everything. It was as though she was looking at the world from four different vantage points at once, and two more in the future. She saw her brother roll and she saw him get up at the same time. But when she moved to stop him she saw him stumble back, never reaching the place where he would have stood if he had rolled. Every move was like that. She knew where to place her blade and when. She knew how hard to strike and when to turn. She felt the eyes of the entire village upon them as the twins circled each other. And with each blow she felt the shift in the villagers' gazes. Their moods were turning from shock to disbelief, and then to awe. Those around her were understanding what she understood. They saw, perhaps with less clarity, but they saw what she saw. They saw her reasons, they saw her truth, they saw her justice. When the moment was right, Kela leapt into a spinning strike and landed in a crouch on the ground with her knee on Dar's chest and her blade at his throat. He looked up into her eyes. He saw then, too. He saw it all. "What will you do, Kela?" he whispered. "What judgment will you pass? I am guilty." Kela realized that for the first time in their lives she had the power. And she realized she did not want it. Power over Dar was not what she had sought. Balance was what they needed. She smiled down at her brother. "Just as there cannot be light without darkness, day without night, there cannot be innocence without guilt." She removed the blade from Dar's throat and she stood. "Alone I am only one side of a blade. Together we are the sword of Justice." She extended her hand, offering it to Dar. "Will you join me?" His eyes locked on hers. He took her hand and allowed her to help him up. For the first time, they stood together before the villagers as equals. "The man will have a fair trial," Dar said. "Justice will be served here today." "So say the Rules of the Reeds!" the villagers intoned. Kela turned toward the tone. The young girl from the tree stood by the metal plate, holding the hammer. She smiled at Kela.